While strolling through Rome, it’s impossible to miss the city’s elaborate and delightful Baroque architecture and art. Much like Florence is the showcase of Renaissance architecture, Rome is a jewel box of Baroque design. Of course, you’ll find a little of everything on display in the Eternal City, including buildings and ruins that span centuries and styles from 2,000 years ago to the most modern. Yet Rome’s Baroque architecture and fountains are among its most appealing sights. 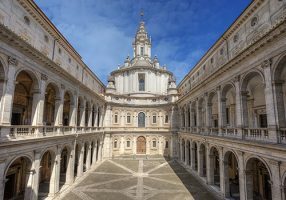 You can enjoy the Baroque masterpieces at every turn in Rome due to the genius and the rivalry in the 1600s of two master architects and artists, Gian Lorenzo Bernini and Francesco Borromini. According to the stories, Bernini was quite popular and sought-after along with clearly being a prolific sculptor and architect. He is famous for designing St. Peter’s Square, the Fountain of the Four Rivers in Piazza Navona, and sculpting stunning statues that include the incredible Apollo and Daphne and many more. Borromini had a more difficult personality that may have lost him some commissions, but his works are spectacular in originality and beauty. Look at the unique dome and bellfry of Sant’ Ivo alla Sapienza or the sense of movement on the facade of the Church of San Carlo alle Quattro Fontane. He was not only a master of the Baroque style, but also an innovator unafraid of creating completely new designs. 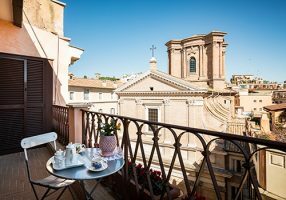 Italy Perfect’s Angelina apartment is directly in front of one of Borromini’s churches where you can admire, as they say, his ability to use marble and stone to flow like fabric. Interestingly, in the same church, Sant’ Andrea delle Fratte, there are two original Bernini statues of angels, the models for the series of large angel statues he created for the Ponte Sant’Angelo bridge. The stories of their rivalry include Bernini sculpting figures of the rivers in the Four Rivers fountain in Piazza Navona once hiding his head and another raising his hand to shield his eyes from the view of Borromini’s Sant’ Agnese in Agone church facade just in front. (Although the timing isn’t quite right, it’s still a good story!) It’s also said that Bernini aimed the rear of the charming Elephant and Obelisk sculpture in front of Santa Maria Minerva at Borromini’s home. Whether or not the stories are true, it’s thanks to the talent of these two remarkable architects and artists that we can enjoy the atmosphere of Baroque Rome today.